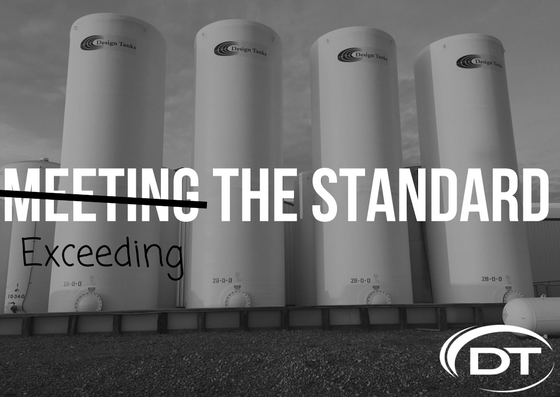 As a custom manufacturer specializing in meeting the unique needs of our customers, our exposure to these different standards is much higher than for the manufacturer that produces a cookie cutter tank. To add some clarity to the conversation, we’re focusing on where Design Tanks is positioned when it comes to standards and what that means in terms of the tank you order. Applies to standards for Design Tanks large chop-hoop filament-wound tanks. The Design Tanks Difference: ASTM D3299 allows the corrosion liner, which helps protect the tank from corrosive contents, to be included in the tank’s wall measurement. We build a heavier, more robust tank that always exceeds the standard for wall thickness. The result is a quality product with a very low incidence of tank failure. The customer receives a tank that exceeds the standard! Applies to manufacturing standards for Design Tanks contact-molded small- and medium-sized tanks. Includes requirements for materials, properties, design, construction, dimension, tolerance, workmanship, and appearance. The Design Tanks Difference: Design Tanks complies with the design strength requirements of ASTM D4097, utilizing a rigorous in-line and end-of-line quality control process plus testing of all resins and incoming materials.